I was first introduced to Harry Price in 1977 at the tender age of ten through the pages of Daniel Farson's unfortunately named Beavor Book of Horror. This was in my junior school days in Chessington, Surrey & the said book was bought through the 'Chip Club', the school book club. I had been exposed, if that is the right word, to things supernatural a couple of years before when I'd started to watch the old Universal horror pictures as well as the then new colour remakes with my father (I saw Hammer's Dracula, Prince of Darkness film on holiday in a caravan in Bognor Regis of all places in 1974!) & since then I'd been a firm fan of things not of this world. Big influences for me are the books of the 'Prince of Thriller Writers' Dennis Wheatley and master of horror Guy N. Smith (see below). The Dan Farson book was a step up from my first piece of spooky literature which was The 3rd Armada Ghost Book which I remember was edited by Mary Danby & contained a good assortments of ghostly monks, White Ladies & the like. In the haunted houses section of his book, Farson included the obligatory entry on Borley Rectory and briefly told the story of 'The Most Haunted House in England'. His descriptions of the ghostly nun, the spectral coach & four and the plethora of poltergeists caught my imagination, but it wasn't until a year or so later that my interest in Borley was firmly established, by Dan Farson yet again, this time with his Hamlyn Book of Ghosts. This time the Borley entry was not only much bigger but lavishly illustrated with the familiar historic photographs - ruined Rectory building, sleeping observer & wall writing - as well as several colour illustrations depicting flying bottles & a sinister black hand appearing around a door frame. One painting, titled The Night of the Fire at Borley Rectory, was especially impressive with its images of the famous Rectory gables silhouetted against a raging inferno while eerie figures were depicted walking amongst the flames. My second Farson book also contained other pieces about Price including a photograph showing him at work in his rooms at the National Laboratory of Psychical Research as well as mentioning that he lived in the village of Pulborough in West Sussex. Now my parents had friends who had retired in the mid 1960s to a tiny place called Coldwatham which is only a few miles from Pulborough. I knew the area quite well as during the 1970s we spent many pleasant Sundays driving down to visit them. This now became Harry Price country! I was thrilled to know that he was a real guy who lived in a place I was familiar & had investigated this amazing haunted house in which I believed every word about. However, the seal of my lifelong interest in Price was finally set with a birthday present from my mother, bought surreptitiously in my presence on a shopping trip to W.H. Smith's in Walton-on-Thames in the early 1980s. 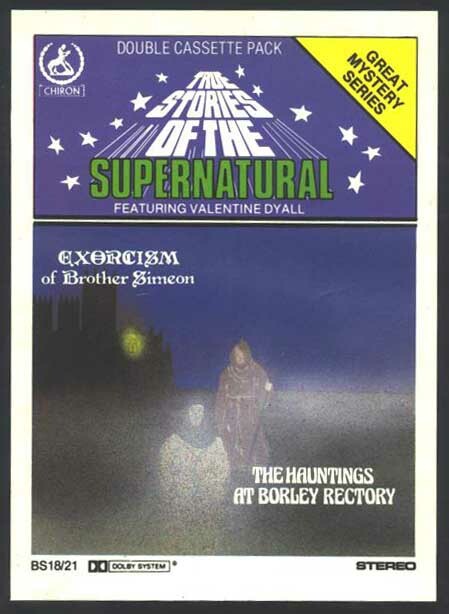 The whole Borley saga & Harry Price was brought vividly to life in an audio drama titled The Hauntings at Borley Rectory, part of a series called 'True Stories of the Supernatural' which was introduced by the 'Man in Black' himself, Valentine Dyall! On this double cassette pack the Borley ghosts were partnered by another piece which described the exorcism of the spirit of a renegade monk from a well-to-do house in Edinburgh, but it was the Borley drama which took centre stage, complete with sinister footsteps, hysterical screams, smashing glass & a wonderfully creepy soundtrack complete with an un-earthly musical saw. Not only did the ghost of Maire Lairre make an appearance ("Must I walk this earth forever...?" she wailed) but so did Harry Price! In a deadpan voice one of the actors read out part of Price's 'Blue Book of Instructions' given to his rota of observers when they investigated the house in the late 1930s, beginning with the memorable phrase "If you see an apparition, do not approach it"! For me Harry Price has always been somewhere in the background, a charismatic adventurer who I can truthfully describe as a hero figure of mine. Over the years I have managed to obtain copies of his books, starting with a battered but brave reading copy of The End of Borley Rectory which I came across on holiday with my young family in Lyme Regis, which have kept my enthusiasm for Price alive. With my views of Borley and of course Harry somewhat sobered by the books which came after his death, I still feel he is an important figure in the history of British psychical research and despite his love of the limelight & dubious conduct at times, deserves to be recognised as the major influence on the whole popular ghost-hunting scene that we have worldwide today. My own personal view on Borley is that there was (and still is) genuine paranormal activity there, especially in the time of the Bulls & the Smiths - the continual appearance of a nun-like figure seen over the course of many years, the former window lights & the footsteps & similar noises inside the building are the principle phenomena which give me this view - but that the events of particularly the Foyster years were very much exaggerated to say the least. With the advent of the internet, a medium of which I feel sure Harry Price would have approved & would no doubt have utilised himself to further his career, I feel the time has come to make a contribution to increasing our understanding of Price by setting up this website. As mentioned elsewhere on this site, the intention is to provide a resource of information on the web about Harry & his varied career, in which he carried out a huge amount of valuable & sincere work. As the amount of information hopefully increases in the months to come, I feel sure visitors to this site will be able to make up their own minds about Price & the things he did. The world of Harry Price, now receding rapidly into the past, looks out at us from the pages of second-hand books & old documents. My hope is that the technology which is here today will bring Price's world to life & increase our knowledge of the extraordinary personality that was Harry Price. Finally, on a personal note, I would like to dedicate this website to my father Arthur P. Adams (1919-2004), about whom my memories are of nothing but kindness.